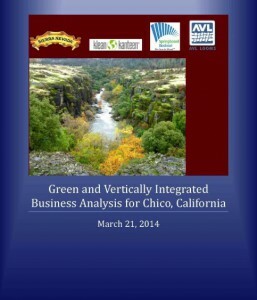 In 2014, Vita Nuova provided technical assistance to the City of Chico, CA in order to 1) define and provide examples of local, green, and vertically-integrated businesses (VIBs), including the characteristics these businesses seek in a community, and 2) identify opportunities to attract local, green, and VIBs to the “The Wedge”, an underutilized industrial area located in South Chico. To meet this objective, Vita Nuova met with city staff to understand the goals for “The Wedge”, and met with numerous property and business owners, developers and economic development professionals to understand the opportunities and challenges associated with revitalizing the area. Vita Nuova analyzed key market indicators to understand the regional and local economic drivers in Chico and researched, identified and interviewed local, green, and VIBs. Based on this research and market analysis, Vita Nuova developed recommendations and next steps for revitalizing “The Wedge” and building a supportive environment for local, green, and VIBs. A significant outcome of Vita Nuova’s research concluded that Chico’s initial objective to attract VIBs from outside the community be shifted to focus on a strategy of retention, expansion and start up to help catalyze redevelopment in the “The Wedge”. Vita Nuova outlined a strategy for Chico to build a supportive environment for local, green, and VIBs by helping to create a network of regional stakeholders to nurture home grown businesses. Vita Nuova identified transferrable findings or lessons learned to help other communities successfully replicate VIB growth.